Games Played. 24 Won 11, Lost 9, Drew 4. Goals Scored. 64 for. 65 against. First meeting of the newly formed Fitzroy Football Club. Some Carlton names? on committee Shearwood, Nudd, Elliott, Kneen. Colours; Maroon jersey and stockings, blue cap and knickerbockers. Practice next Saturday on the Fitzroy Cricket Ground. A split in the Carlton ranks in 1883 by some disgruntled players was largely responsible for the formation of the Fitzroy Football Club. At a meeting of footballers at Garton's Hotel, H.C.A Harrison was farewelled as he was about to leave for 12 months in England. Harrison along with Wills, and Warner started the Melbourne Football Club in 1859. He said local cricketers and rowers had done well over there, and he would try to introduce the Australian game to the "old country." "Mr. M. J. O'Leary, of Tungamah, has received information that the Carlton Football Club will be unable to play the combined teams of the district on a date that was suggested, but will be happy to arrange for next season." Carlton F. C. AGM held at the Orderly Room, Lygon Street. Balance sheets read by the Hon. Sec. M. B. Hearne. Messrs, H. Wilson, T. Maloney, E. M. Brooks, and C. Donovan. Special prize for the second twenty went to J. Melville. Club medals for second twenty went to J. Martin and W. Woodburn. The club has purchased a substantial portable building to be used by the players and the opposition in Princes Park. The club placed on record it's sense in the loss to the club in the death of Mr. George Coulthard after a lingering and painful illness. "The committee desired to place on recordm its sense of the loss to the club by the death of Mr. George Coulthard, after a lingering and painful illness. He woul;d long be remembered as a sterling player and good club member. Prior to his death a match was played with Melbourne Football Club for his benefit on the M.C.C. ground, and the matter being taken up warmly by the Melbourne cricket and football clubs, the whole of the proceeds, amounting to 123 pounds 7s and 10p were placed at his disposal. The Rabbit Club subsequently held a most successful entertainment for the benefit of the deceased family, and the substantial sum of 93 pounds 11 s and 6d was netted. The club felt that it had come through the most trying season with credit. Twenty four matches had been played by the first twenty, of which they won 14 and lost 7, whilst 2 were drawn. The second contest against the Essendon which was declared an undecided game by the central umpire, was subesquently given a win to Essendon by the Victorian Football Association. Ninety-one goals were kicked by the club, and 52 against them. The successful goal kickers were: - Baker 20, Bailey and Elliott 11 each, James Rickards 9, Heatley 8, T. Cameron, Bloomfield, and Whelan 5 each, Donovan 3, Wilson, Woodburn, and Mills 2 each, Page, Conway, Robertson, Smith, Daly, Coventry, J. Cameron, and Slattery 1 each. Out of 14 matches played by the second twenty, they had won 9, and lost 3, whilst 2 were drawn, the successful goal kickers being - Woodburn 13, Aitken 5, McKay 4, Jos Richards/Rickards, and Manuels 3 each, Leach, Donovan, Muir, Bismire, Mair, Mills, and W. Slattery 1 each. On the motion of the president, seconded by Mr. A./T. Bleasdale, the report was adopted. Patrons; Messrs, E. Latham, J. Bell, J. Pigdon. Vice presidents; Messrs, J. Gardiner, J. A. Turnbull, A. Gillespie, V. Robertson, T. S. Marshall. Hon. Sec. and Treasurer; Mr. M. B. Hearne. Hon. Sec second twenty; Mr. W. C. Donaldson. Captain; Mr. J. Baker. Vice captain; George Smith. Committee; Messrs, S. Bloomfield, G. Robertson, F. McIntosh, R. H. Frayne, James Rickards, E. M. Brooks, M. A. Fletcher, O. T. L. O'Brien, W. Cook. Committee for second twenty; Messrs, J. Sutherland, W. Henry, R. Cooper, F. Bismire, J. Melville, W. Wood, J. Martin, R. Aitken, M. Slattery, H. McKay. An illuminated address was then presented to Mr. E. M. Brooks, in a short speech made by Mr. J. Gardiner as a reward for his services to the club. Messrs. T. Maloney, H. Wilson, and Charles Donovan received similar presentations. A handsome desk was then given to the captain of the first twenty, Mr. J. Baker. Presentations to Messrs. Martin, W. Woodward/Woodburn of a valuable gold ring and chain, and the prize given by Mr. J. Riley, consisting of a handsome tea and coffee service, to Mr. J. Melville, were then made. A vote of thanks to Messrs. Riley, McKenzie, and Cook, for their liberal donations to the club was carried unamiously. A large number of new members were admitted, and vote of thanks to the chairman closed the proceedings. The Herald published some extracts from these books. Abbotsford, Alberts second, Albert Park, Albion second, Avenue, Balmoral, Brighton second, Bristol United, Britannia, Brunswick, Carlton second, Carlton Imperial, Carlton Standard, Canterbury, Caulfield, Clarence second, Clarence, Clifton Union, Clyde, Courtney United, Cremorne, Criterion, East Melbourne, East Melbourne second, Eastern Market, Elgin Union second, Essendon second, Evansdale, Excelsior, Fitzroy Alberts, Fitzroy Alberts second, Fitzroy Juniors, Fitzroy second, Footscray, Footscray Alberts, Footscray Excelsior, Fortrose, Gowerville, Grosvenor, Hotham second, Hotham Albion, Keilor, Kensington, Kensington second, Kingston, Lancefield, Laurel, Lincoln, Malvern, Melbourne second, Melbourne Imperial, Melbourne Juniors, Melbourne Standard, Middle Park, Moonee Ponds, Montague, Nelson, Newmarket Juniors, Normanby, North Brunswick, North Carlton Imperials, North Carlton Juniors, Northcote, Northcote second, North Park second, North Richmond Juniors, Park United, Parkhill Juniors, Parkside, Parkville, Port Melbourne Excelsior, Powlett, Queensbury, Richmond Standard, Richmond Union, Riversdale, Roden Alberts, Rose of Denmark, Rose of Hotham, Rosebury, Rosslyn Alberts, Royal Park, Royal Park second, Sandridge, South Melbourne second, South Yarra second, South St.Kilda, Southern Cross, Star of Carlton, Star of Richmond, St.Kilda Alma, St.Kilda Alma second, St.Kilda Royal, Sunbury, Sunnyside, Twilight, Union Jack, Union Jack second, Waterloo, Waverly, Wellington, West Brighton, West End, West Melbourne, Williamstown second, Williamstown Balmoral, Williamstown Juniors, Williamstown Juniors second, Williamstown Osborne, Young Adelphians, Young Victoria. Practice match on Princes Oval at 3pm. V.F.A. annual meeting held at Young and Jackson's Hotel. Discussed the best way of determining the premiership this year. A permanent committee be formed to appoint umpires for each week's matches, instead of the present practice of the clubs arranging umpires. Geelong, South Melbourne, Ballarat, Fitzroy, Williamstown, Melbourne, Hotham, Essendon, South Ballarat (formerly Albion Imperial), Carlton, Horsham Union. The Australasian had the arrivals and departures at Carlton. Elliot and Shearwood, and probably the younger of the Camerons to the newly formed Fitzroy. Johnson, a promising player from Brunswick. Sebire from Essendon "whose allegiance last year was rather "mixed" between the dark blue and the red and black." 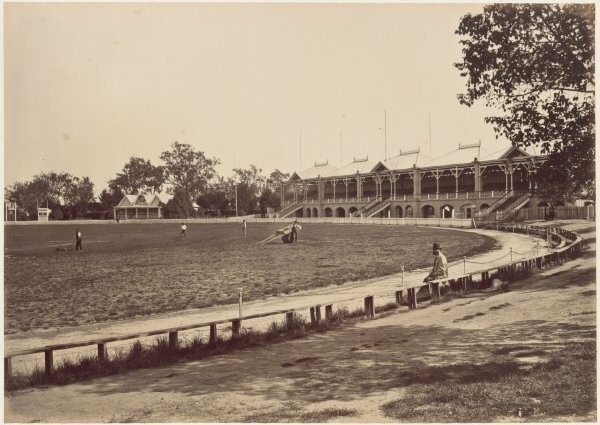 Carlton played Waverley (23) at Prince's Oval. Waverley is a Carlton suburban team believed to have been based in the vicinity of Madeline (Swanston) Street. The rain and drizzle stopped before the game which made the ground slippery and the ball greasy. The juniors played well, but their kicking for goal let them down. Joseph Rickards also played for the juniors, perhaps Waverley were short of players. Aitken, Bloomfield, Beere, T. Cameron, Cook, Donovan, Fitzgerald, Fleming, Hannaysee, Hall, Joyce, Joyce, Johnson, Lewis, Maloney, Martin, O'Beirne/O'Bern, Smith (Capt. ), M. Slattery, Woods. Emergencies; Souter, Jos. Rickards, Melville. Best of the new players; Fleming, Johnson, Cork (Cook? ), O'Beirne (O'Bern? ), Beere, Lewis. Players mentioned; (16) Donovan, Smith, Joyce, Aitken, Fleming, Lewis, Beere, Fitzgerald, Johnson, Bloomfield, O'Bern, Wilson, Brown, Cook, Slattery, Joyce (the elder). Carlton Reserves played a practice match alongside Princes Oval. "Frayne and several other familiar players will be missing from the ranks of the Carlton; but Baker the captain has some good material to work on, and, if the new comers only profit by his example, The Dark Blues ought to be "in it" this season. The Star of Carlton, as usual, has been drawn upon to recruit the ranks of the senior club, and Lewis and O'Bern should worthily uphold the reputation of the Star, in which so many sterling players have graduated. Beere, (the late captain of the Carlton Alberts) is well spoken of, so are Fleming and Johnson from the Brunswick, and the Waverley representative, Cook, is worth his place in any team." A Permit Committee will meet every Wednesday and appoint field umpires for each match. Umpires to be paid 1 guinea plus travelling expenses. The two competing clubs to pay all costs. Deciding the premier club is a problem, general opinion was that no satisfactory plan could be arranged. It was felt that the public would make their minds up as to which was the premier club. "That if any associated club refer to the association at the end of the season as the the question of premiership, the association may deal with the subject." Stars are one of the stronger junior sides, and with 3 extra players they are quite a handfull for the senior teams. Despite a strong wind blowing across the ground, it did not stop good play by both sides. Bloomfield kicked two splendid goals, one off each foot, from a good distance. Aitken, Bloomfield, T. Cameron, Cook, Donovan, Fitzgerald, Fleming, Heatley, Joyce, Joyce, Johnson, Lewis, Maloney, Martin, O'Bern, Regan, Smith (Capt. ), M. Slattery, Soutar, Woods. Carlton Reserves played Avenue at Royal Park. Parkville residents formed the Avenue Football club in March 1883. Albert Coulson was it's first vice-captain. No Carlton players mentioned, however, future Blues brothers Andy and Charlie Coulson contributed 3 goals between them for The Avenue. They would be recruited by Melbourne, and after a few years they would transfer to Carlton and become very good players and leaders for the Dark Blues. There is a dispute brewing in Brisbane over the use of Queen's Park for football. Two Rugby clubs were formed last week with a total membership of 80. The park is the only available area for football in the city, and there is not enough room for all to be catered for. The Queensland Football Association says the Melbourne game is the established game of the colony with clubs in Brisbane, Ipswich, Toowoomba, Maryborough, Gympie and other towns in the colony, with a membership of over 900. In addition all the public schools play the Australian game. The Minister for Lands in Queensland, Mr. Dutton, was asked to intervene, and he said that the majority should have the greater claim. The Argus reporter doubts that there had ever been a larger crowd at the ground. A fine day, but the ground was soft and heavy. The Reds won the toss, and Baker kicked off at 3pm. Melbourne's poor goal kicking kept the Blues in the game. The Blues put their loss down to "lack of practice." Baker (Capt. ), Bloomfield, Bailey, T. Cameron, Cook, Donovan, Fitzgerald, Fleming, Heatley, Hennessey, Joyce, Joyce, Johnson, Maloney, Morris, O'Bern, Jos. Rickards, Smith (Vice Capt. ), Wilson, Woods. Best; Bloomfield, Rickards, Fleming, Johnson, Cook. Players mentioned; (15) Baker, Harry Wilson, Bloomfield, Hennessy, Joseph Rickards, Smith, Donovan, Maloney, Cook, Bailey, Fleming, Fitzgerald, O'Bern, Johnson, Morris. Carlton 3rd. Played 3 Won 2, Lost 1, Drawn 0, Goals For 8, Against 4. Carlton Reserves played Melbourne on the Melbourne Football Ground..
Aitken, Bismire, Carter, Cook, Crane, Coulthard, Fairnie, Elliott, Hadely, Jackson, Lemon, Leach, Martin, Melville, Mair, McKay, O'Connor, Plummer, Slattery, Shand, Ulmer, Wardrop. "Morris, the new man in the Carlton team from the Maryborough district, did not play up to what was expected of him, but, it being the first big match he has played in, he may have been a little nervous, and will easily get over that." The Sportsman says "It is rumoured that Harry Wilson will not play again for Carlton." "Some members of the Carlton Club are rather warm in their language against the committee for putting out of the team a player named Lacey, from the Waverley, as he is considered a first class man. It appears that he was chosen to play in the opening match, and, not playing up to expectation, he was put out of the next match. The player mentioned, not liking such treatment, went over to the Melbourne, who put him in the team, and consider him one of the best players in the twenty." South won the toss and kicked to the southern goals aided by the wind. Soon after the start Smith accidently collided with an opponent and the southerner was forced to leave the field. Then early in the second half Bloomfield clashed, and his opponent too had to leave the ground. As a player cannot be replaced, this meant the Blues had the advantage of extra players throughout the match. Both teams' kicking at goal was poor. Aitken, Baker (Capt. ), Bailey, Bloomfield, Cook, Cameron, Crawford, Donovan, Fleming, Fitzgerald, Hennesseye, Johnson, J. Joyce, Maloney, Morris, Martin, Jos. Rickards, Smith (Vice Capt. ), Wilson, Woods. Best; Hennesseye, Wilson, Joyce, Bloomfield, Cook. Players mentioned; (15) Smith, Bloomfield, Baker, Wilson, Hennessy, Joyce, Cook, Donovan, Bailey, Woods, Fitzgerald, Johnson, Morris, Maloney, O'Bern. South won a very even contest. "A fusion of fresh blood into the ranks of Senior Football twenties now seems the order of the day, and the Carlton Club no doubt will be materially strengthened by the inclusion in it's ranks of W. Campbell and Soloman, late of Sandhurst, whence they come with an excellent reputation. The former will don the old club's colours for the first time on Saturday next, in their match with Norwood, but the latter, through having played as a substitute in a match on Saturday, is debarred from doing so for the next three Saturdays." The Australasian reports that in Tasmania, the Southern Tasmanian Football Association has adopted the Laws of Australasian Football which were agreed to at the conference in Melbourne last November. "and decided to adhere to the Tasmanian rules, which only vary from ours in two respects, namely, allowing no pushing from behind, and kicking the goals over a cross bar. I daresay, however, they will come to in time." Carlton played Norwood (South Australia) at the M.C.G. All of the net proceeds will be donated Melbourne charities. A. E. 'Topsy' Waldron former Carlton player, captain of Norwood. A perfect day for football and the ground was in good condition. The Blues won the toss and kicked with the wind to the northen goal. The match got underway at 3pm. Norwood were lighter than the Blues and were quick and clever with their little marking, they had the better of the Blues before half time. Norwood scored a couple of behinds before Hyland scored the Blues' first goal. Norwood then answered with two goals. Bloomfield equalized, however, Norwood scored a behind by hitting the post and then they goaled to take the lead. The Blues went forward and put the ball through, but the goal was disallowed as the time had run out. However in the second half the fitter Blues wore down their opponents, but poor kicking for goal denied the home team a win. Hanneysee scoring a goal just before full time. Aitken, Baker (Capt. ), Bailey, Bloomfield, Cook, Crawford, Donovan, Fitzgerald, Fleming, Hyland, Hanneysee, J. Joyce, Johnson, Maloney, Martin, Morris, O'Bern, Rickards, Smith (Vice Capt. ), Woods. Umpire; M. Minchin, South Melbourne. Players mentioned; (15) Hyland, Smith, Bloomfield, Cook, Hennessy, Baker, J. Joyce, O'Bern, T. Joyce, Woods, Maloney, Donovan, Bailey, Martin, Fleming. Carlton Reserves/Second Twenty played Daylesford at Daylesford. Players on Friday caught the 3.35pm train at Spencer street to Daylesford. The Norwood Football Club were guests of Carlton at a banquet held at Clement's Hotel on Monday evening. Around 90 people attended. Carlton president Captain R. Robertson presided. After dinner toasts were given to the Norwood and Carlton clubs. Mr. Diamond thanked Carlton for their hospitality and looked forward to entertaining the club when they visit Adelaide next month. Carlton has proposed to forego the match next week if Essendon agree, so more people will attend the Norwood match against Geelong on the nearby M.C.G. After some more toasts and music the most agreeable and pleasant evening finished at 11.30pm. Essendon kicked with the breeze. Carlton's third goal was kicked in the darkness late in the game. The Blues had the better of the Dons in the second half, but the goals eluded them. Even though they lost the match The Australasian said that this was the best game the Blues had played so far this season. Baker (Capt. ), Bailey, Bloomfield, Cook, Crawford, Clydesdale, Donovan, Fleming, Heatley, Hanneysee, Hyland, J. Joyce, T. Joyce, Johnson, Maloney, Melville, O'Brien, Rickards, Smith (Vice Capt. ), Woods. Best; Bloomfield (BOG),Cook, Baker, Donovan, Smith, Hanneysee. Players mentioned; (14) Aitken, Moloney, Bailey, Baker, Bloomfield, Heatley, Hennessy/Hanneysee, Melville, Rickards, Donovan, Woods, Cook, Smith, Johnson. "The Carlton Club is about to lose the services of Crawford, he is leaving for Adelaide on Friday next. This is much to be regretted, as when in form he is one of the best back players in the colony, and withal a jolly good fellow, who will be much missed by his many associates." Last week the newcomers had beaten Melbourne. This was the very first meeting of these two clubs, the game got under way just after 3pm. Ex Carlton players, Cameron, Elliott, and Shearwood, (now Fitzroy's Vice Capt. ); were playing for the 'Roys. Fitzroy won the toss and kicked to the western end aided by the breeze. The Blues kicked nine consectutive behinds and tired late in the second half. Carlton were the better team, however they just couldn't put the ball through the sticks. Baker (Capt. ), Bailey, Bloomfield, Cook, Clydesdale, Fitzgerald, Fleming, Heatley, Hanneysee, Hyland, Johnson, J. Joyce, T. Joyce, Melville, Moloney, Morris, O'Bern, Rickards, Smith, Woods. Players mentioned; Baker, Hannaysee, Woods, Bloomfield, T. Joyce, Bailey, Cook, Hyland, Fleming. Carlton Reserves played Hawksburn at Princes Oval. The Blues lost the toss and kicked to the western end. C. Jackson kicked off putting the ball into play for the Blues. Carlton were out of the game after half time and failed to add to their score. One of the better players for the vistors was Moorhouse, could this be "Jigger" Moorhouse? Aitken, Bismire, Carter, Cook, Coulthard, Dennington, Dunn, Gordon, -Gordon, Hadley, Jackson, Lemmon/Lemon, Launders, Lewis, Mair, Martin, Murphy, O'Connor, Shand, Slattery, Tickle, Westwood. Better Blues players, William Westwood, C. Jackson, Aitken, Slattery, Martin. "It is reported Cameron (formerly of the Carlton, but now with the South Ballarat Club) is very anxious to be enrolled in the ranks of the Melbourne. The conduct of this well-known footballer is somewhat eccentric, and his treatment of the clubs with which he has more or less connected is certainly not to be commended. To commence the season he joined the Fitzroy ranks, and was appointed vice-captain, and practised regularly with that club. We next find him playing in the ranks of Carlton in their earlier matches. From them he suddenly retires without offering any excuse or explanation and joins South Ballarat. Conduct like this deserves severe reprehension, and should not be encouraged, and senior associated clubs should decline receiving such delinquints into their ranks." "Topsy Waldron, late captain of the Norwoods, SA, and Randall of the same team, and who were reported to have joined Essendon, have joined the Carlton. Toohey, of Little River, a very fine wing player will also don the same colours. With these additions to the team, the Carlton will be most materially strengthened." Carlton were strengthened by Waldron and Randle/Randall two Norwood players whose club recently toured Melbourne. A. E. Waldron is a former Carlton player. Drew and Kelly both ex Waverley played. Baker of Carlton won the toss and elected to kick towards the railway end, the game commenced at 3.10pm. Hannaysee kicked the ball to Kelly who was near the goals but on a very tight angle. Instead of kicking it forward towards the goal, he centred it, but behind his mark. The umpire ordered Kelly to retake his kick, and this time he scored a goal. Baker (Capt. ), Bloomfield, Cook, Clydesdale, Drew, Donovan, Fleming, Fitzgerald, Hyland, Hanneysee, Johnson, J. Joyce, Kelly, Melville, O'Bern, Rickards, Randall, Smith (Vice Capt. ), Woods, Waldron. Best; Bloomfield, Clydesdale, Waldron, Hanneysee, Kelly, O'Bern. Players mentioned; (15) Baker, Waldron, Randle/Randall, Hannaysee, O'Bern, Bloomfield, Kelly, Clydesdale, Drew, Rickards, Fitzgerald, Donovan, Smith, Fleming, Cook. Carlton Reserves played Hotham at the Hotham Recreational Reserve. Aitken, Coulthard, Cook, Carter, Dennington, Dunn, Gordon, Gordon, Hadley, Jackson, Lemon, Launders, Lewis, Mair, Murphy, Martin, Manly, O'Connor, Shane, Slattery, Tickle, Westwood. Goals; Mair, Lemmon, Carter, Martin. 1. Appear in the grandest football uniform you can. 2. Make as much noise in the field as you can. 3. Whenever you get a chance kick the ball out of bounds. 4. Always lose your place. 5. Take no notice whatever of your captain. 6. Whenever you are not sure which to go for the man or the ball - go for the man. 7. When you get the ball try and run through ten men with it, but don't let it go. 8. Always try and miss the ball and kick your opponent's shins. 9. When you find your man too good lie down, this will save him knocking you down. 10. Play for the spectators; kick all the goals yourself and never mind who wins. 11. Whenever you are knocked over apply for a free kick. Carlton left on the S. S. Adelaide at 1pm. from Sandridge (Port Melbourne) railway pier for their tour of South Australia. A. E. "Topsy" Waldron with his wife, and Randall accompanied the team on the the ship. 22 players named in the touring side. R. Aitken, J. Baker, S. Bloomfield, J. Cook, J. P. Drew, E. J. Fitzgerald, R. Fleming, R. Heatley, W. Hanneysee, F. Johnston, J. Joyce, T. Joyce, J. Martin, J. Melville, W/H O'Bern, J. Plummer, James Rickards, Joseph Rickards, M. Slattery, G. Smith, J. Woods, M. Whelan. .*G. Conway appears in the image of the team in Adelaide and he looks very much like Jack Conway. Most newspaper and shipping reports mention G. Conway and Jack's brother was named Henry Conway. Carlton Football Club arrived by the S. S. Adelaide early on Friday 20th at Port Adelaide, and were met by S. A. Association delegates and several prominent Port Adelaide players. From their hotel they were driven to Kensington Oval and greeted by the mayor of Kensington and Norwood. Champagne and light refreshments were provided. Several toasts were made, and Carlton's McArthur B. Hearne, Mr. Conway and Captain Jack Baker responded. Later, that afternoon the team watched the match between Port Adelaide and Norwood on the Adelaide Oval. Middle Row; R. Morgan (plain clothes), John G. Cook, Edgar Fitzgerald, John 'Jack' Melville, J. Martin, James Rickards, Thomas Joyce, J. Plummer, Mick Whelan, Barney Murphy (plain clothes). Carlton played South Adelaide on the Kensington Oval. South Adelaide's vice captain is a player named Wattling, future Blue Walter Wattling? A sunny day for football after a few days of wet weather. Baker lost the toss and the Blues kicked to the southern end. (Carlton) "... played well together, always kicking when they had the chance and shepherding splendidly. Their followers certainly stood first, and were far too good for the Souths. Bloomfield, Hannaysee, and O'Byrne/(O'Bern) in this department were particulary noticeable, and there was very little to choose between the three. I am inclined to think Bloomfield on Saturday was a little the superior. Cook, forward, is very smart and cool, very seldom losing his kick. Cook is small, but very smart dodges well, and is unselfish. Smith made some fine runs, and Joyce on several occasions prominent. The back men, Baker, Fleming, and Melville, had very little to do, but what they did they did well. Where a team as a whole was so good it is impossible to particularize players, but the above were perhaps the most conspicuous." "Johnston, Whelan and Plummer played forward. Joyce in the center, rendered valuable assistance." Aitken, Baker (Capt. ), Bloomfield, Cook, Drew, Fleming, Fitzgerald, Hannaysee, Heatley, J. Joyce, T. Joyce, Johnston, Melville, O'Bern, Plummer, John Rickards, Slattery, Smith (Vice Capt. ), Whelan, and Woods. Goals; Hannaysee 2, J. Joyce, Fitzgerald, Plummer / Another report said Hannaysee 2, Whelan, 2, Plummer. Best; Baker, Hannaysee, Smith, Rickards, O'Bern, J. Joyce, T. Joyce. Players mentioned; (20) Hannaysee, O'Bern, Cook, T. Joyce, J. Joyce, Bloomfield, Whelan, Baker, Johnson, Fitzgerald, Aitken, Rickards, Plummer, Smith, Fleming, Melville, Heatley, Slattery, Rickards, Woods. Carlton Second Twenty/Reserves played West Melbourne at Princes Oval. On completion of the match, the South Adelaide Club left on the S. S. Adelaide for N.S.W. and for a series of matches in Sydney starting on June 28. "Bailey, of the Carlton, it is said, intends to cast his lot in with the Hotham." Carlton played the Adelaide Suburban Association (23) at Kensington Oval. The day was miserably cold and the ground was a quagmire. It was impossible to hold, or bounce the ball. The Combine's extra three players made a difference. The Blues were headed in the second half and just scrambled out of the game with a draw, with a late goal to Johnston. James Rickards and Martin did not play, they were replaced in the side by Fitzgerald and T. Joyce. Aitken, Baker (Capt), Bloomfield, Cook, Drew, Fleming, Fitzgerald, Hannaysee, Fleming, Heatley, J. Joyce, T. Joyce, Johnston, Melville, O'Bern, Plummer, Rickards, Slattery, Smith (Vice capt. ), Whelan, Woods. Umpire; Gill, from the Adelaide club. Players mentioned; (17) Baker, Heatley, Slattery, Hannaysee, O'Bern, Drew, Cook, Aitken, Johnston, Whelan, Plummer, Fitzgerald, T. Joyce, Jack Joyce, J. Rickards, Fleming, Bloomfield. Carlton played Norwood on Kensington Oval. Weather was fine, but the ground was soft. Former Blue, A. E. "Topsy" Waldron captained Norwood, and another ex Blue George Bragge also played for the blue and reds. A very even match throughout, with Norwood looking like winning late into the game. Baker won the toss and kicked with the wind. Goals; Bloomfield 2, Baker, James Rickards. Best; Bloomfield (BOG), Hannaysee, Baker, Slattery, Woods, Smith, and O'Bern were prominent. Players mentioned; (18) Baker, Bloomfield, Whelan, Plummer, James Rickards, Joe Rickards, O'Bern, Drew, Hannaysee, Slattery, Woods, Joyce, Martin, Smith, Johnston, Cook, Aitken, Heatley. In the evening the Carlton football team attended Benhamo's Circus' "Gala Night." Bismire, Coulthard, Cameron, Carter, Frayne, Gordon, Hadley, Highland/Hyland, Jackson, Lemmon, Launders, Mair, Manly, McIntosh, Nairn, Roberts, Robertson, Richards/Rickards? Shand, Tickle, Taylor, Westwood, Waldron. Best; Mair, Carter, Saunders, Rickards, Nairn, Hadley. The Avenue team contained players named Coulson, Gellately & Leydin all to become famous Carlton players. Carlton played Port Adelaide at the Kensington Oval. The weather was perfect for football. The umpire Carlton selected was F. Letchford of the Norwood club. Port objected to him on the grounds that he was a slow runner and he was not up to the task. So F. Wedd from North Adelaide was chosen. Just before the game commenced the Carlton manager at the suggestion of one or two Carlton supporters objected to Umpire Wedd, and they wanted R. Randall as the umpire. Port Adelaide then objected to Randall because he had played with the Blues recently when Norwood had finished their tour of Victoria, and Randall was expected to join the Blues in a few weeks. The Blues persisted and eventually got their way, and Port did not want the crowd to be waiting any longer. Port Adelaide's captain, R. Turpenny (a former Carlton player) won the toss and they kicked with the wind. "During the first half, the central umpire (Mr. Randall) so palpably favored the Carltons by giving them marks against the home team for apparently imaginary breaches of the rules that he was frequently hooted by the spectators." During the half time interval, Port urged that the umpire be changed, but Carlton refused. The start of the second half was delayed with neither side refusing to budge on the matter. The secretary of the association was called, and Port decided to resume the match with umpire Randall in charge. Port had the better of the game, but their kicking was erratic and they could not score the goals. In the second half they dominated, but the Blues scored each time they went forward. Another match report said that despite the crowd's complaints, the umpire favoured the home team. So which version of the story is correct? Aitken, Baker, Bloomfield, Cook, Drew, Fleming, Fitzgerald, Hannysee, Heatley, Johnson, Joyce, Martin, Melville, O'Bern, James Rickards, Jos. Rickards/Joe Rickards, Slattery, Smith, Whelan, Woods. Goals; Baker, Hanneysee, Bloomfield, Whelan. Another report said Whelan 2, Baker, Bloomfield. Players mentioned; (20) Johnson, Heatley, Melville, Fleming, James Rickards, Jos. Rickards, Cook, Hannaysee, Baker, Whelan, Joyce, Bloomfield, Slattery, Woods, Smith, Aitken, Drew, Martin, Fitzgerald, O'Bern. After the match the team was entertained at dinner by local politician Mr. E. T. Smith MLA. Adelaide Observer's report of the reception given to the Carlton team. The Carlton football team sailed for Melbourne on the S. S. Adelaide. Prior to departure they were entertained in the town hall by the mayor of Adelaide. The Port Adelaide footballers cheered them off at the wharf. The Carlton football team arrived back in Melbourne on board the S. S. Adelaide. The weather was calm and fine, and the ground was in excellent condition. The Blues were on the end of a comprehensive thrashing. This is the greatest drubbing the Carlton Football Club has received in it's 20 year history. When Geelong kicked three goals in the first ten minutes, the game was as good as over. The Pivots then added another three goals before half time. Baker (Capt. ), Bloomfield, Cook, Drew, Fleming, Hanneysee, Hyland, J. Joyce, Johnston, Kelly, Moloney, Melville, O'Bern, Rickards, Rickards, Slattery, Smith (Vice Capt. ), Woods, Whelan. Best; Bloomfield, Cook, Kelly, Joyce. Players mentioned; (15) Baker, Hanneysee, Smith, Joyce, Cook, Woods, Slattery, Bloomfield, Fitzgerald, Donovan, Melville, Whelan, Johnston, Kelly, Fleming. The Geelong Advertiser Monday 07 mentions Plummer and Randall amongst other Carlton players. Bismire, Carter, Coulthard, Elliott, Gordon, Gordon, Hadley, Jackson, Lemmon/Lemon, Launders, Mair, Manly, Martin, Nairn, Plummer, Roberts, Rickards, Shand, W. Slattery, Tickle, Taylor, Westwood. The colour portrait of some of the leading footballers has been printed by Troedel & Co of Collins Street, for publishers Cooper & Wicks. In the centre of the picture is a large, faithful depiction of the late Carlton champion George Coulthard and he is surrounded by portraits of two representatives from each club. Carlton captain J. Baker is depicted on the right hand side and vice captain G. Smith on the left. Former Carlton player A. Shearwood, now with Fitzroy is also shown. See George Coulthard's bio page for the other names of players. The Bendigo Advertiser July 14, "Carlton and Melbourne, who have been playing longer than the present generation of footballers can remember, met on the Melbourne ground, and the result was a win for the reds who kicked the only goal obtained during the game." Threatening rain kept the crowd away, the ground was soft and slippery. Bloomfield's absence weakened the team. The match commenced at 3.15pm. Aitken, Baker, Cook, Drew, Patrick Gleeson, Hanneysee, Hyland, J. Joyce, Johnston, Kelly, Melville, Mair, O'Bern, Jos. Rickards, Randall, M. Slattery, Smith, Spear, Woods, Whelan. Emergencies; W. Slattery, Plummer, Rickards. Best; Baker, Rickards, Kelly, Randall, Smith, Hannaysee. Players mentioned; (16/17) Baker, Cook, Smith, Joyce, Hannaysee, Johnston, Kelly, Randall, Mair/Muir, Whelan, O'Bern, Joseph Rickards, Woods, Melville, Slattery, Spear, Meyer/Mair/Muir? Bismire, Carter, Coulthard, Gordon, Gordon, Elliott, Fitzgerald, Hadley, Holden, T. Joyce, Jackson, Lemon, Lauders, Manly, Martin, McIntosh, Nairn, Roberts, Shand, Taylor, Tickle, Westwood. The Sportsman (p1) interviewed Carlton secretary MacArthur B. Hearne about the Blues' visit. "The cup of misery (says "Side-off" in the Leader of July 19) has been filled to overflowing for the 'dark blues'"
Their old foe, Melbourne, gave them a knock down blow last Saturday, though I am given to understand that the game was honestly was a draw. What has come over the old club? Humor hath it that feelings have never gone smoothly since Power and McHarg left the secretariat, and it would almost seem as if there was some truth in the report. Certain it is that if the old feeling that made the Carlton Football Club a power in the land is not speedily revived it will have to be relegated amongst the "has beens." Williamstown was granted "senior" status and admitted to the V.F.A. this year. According to the Williamstown F. C. history web site, the club was formed in 1864, and it's colours were yellow and black which changed to blue and yellow when the club amalgamated with South Williamstown in 1888. The Blues kicked with wind to the southern goal in first half, but the home team also scored two goals against it. The Villagers win was no fluke. This was Williamstown's first win over a senior team. Toohey either from Little River or Barwon, conflicting reports. Aitken, Baker, Cook, Drew, Patrick Gleeson, Hanneysee, Joyce, Johnston, Kelly, Lewis, Melville, Ned Murphy, O'Bern, Rickards, Rickards, Randall, Smith, Spear, Toohey, Woods, Whelan. Emergencies; M. Slattery, Fitzgerald, Plummer. Players mentioned; (6) Baker, O'Bern, Spear, Murphy, Aitken, Smith. Carlton Reserves played Williamstown at Princes Oval. Bismire, Coulthard, Carter, Elliott, Gordon, Gordon, Hadley, Holden, Hems, Jackson, Lemmom/Lemon, Launders, Leachman, Lewis, Martin, Nairn, Nairn, Roberts, Shand, Taylor, Tickle, Westwood. Presently each club provides a goal umpire for the match. To overcome the bias displayed on some occasions by the goal umpires, the Association will now appoint them as they already do with the field umpire. The goal umpires will not officiate at their team's games, and will be paid 10 shillings for each match plus expenses. It was also decided that the captains will appoint a person (time keepers) to call "time" at half time, and at the commencement of the second half, and at the end of the game. The will relieve the burden on the field umpire and diminish any disputes which arise over the duration of the halves. The Temperance Brass Band played selections throughout the afternoon. The weather was fine and the ground firm. South Melbourne won the toss and kicked to the north end. The home side got off to a good start and rattled on four quick behinds and it looked ominous for the Blues. Then a change came over the game and the visitors started get get on top. Cook was carried off with a suspected broken collar bone, however it was found to be sprained. He was sent home leaving Carlton with 19 men. This win was a surprise for many as the Blues form since returning from Adelaide has been poor. This week, the Blue's team work, running, and kicking had returned to it's best. The "disgraceful treatment" handed out to Umpire Trait who was assaulted by the South Melbourne crowd and by their members in the pavilion reserve, will be discussed at a meeting of the V.F.A. This is not the first time umpires have been poorly treated at the ground and clubs may refuse to play the Southerners. "Bloomy" Bloomfield returned after injuring his leg on a bicycle. Aitken, Baker (Capt. ), Bloomfield, Cook, Drew, Hanneysee, Hyland, Heatley, J. Joyce, Johnston, Kelly, Murphy, O'Bern, Jos. Rickards, Jas. Rickards, Randall, Spear, Smith, Woods, Whelan. Goals; O'Bern, James Rickards, John Rickards, Bloomfield. Best; Bloomfield (BOG), Baker, Aitken, Cook, James Rickards, Heatley. Players mentioned; (14) Baker, O'Bern, Bloomfield, Joyce, Heatley, Aitken, James Rickards, John Rickards, Cook, Johnston, Kelly, Woods, Smith, Randall. Best; Slattery, Rickards, Agis, and Shand. The Sportsman's columnist, "Goal Post;"
"A decided novelty was introduced into various football matches played last Saturday, in the form of a bell. This was rung when the time for starting play had arrived, then for the adjournment of half time, and again when the time set apart for playing had elapsed. It worked well, and is a great improvement on the old style of depending upon the central umpire to watch the time - that functionary has quite sufficient to occupy his mind without being compelled to keep diving into his fob for a watch (which might at any time stop, or go wrong owing to violent action it is exposed to) lest an extra minute should enable one team to put a different aspect on the game to what would otherwise have been the case had time been called at the proper moment. If the Association can only see their way clear to introduce whistles for central umpires (as advocated in these columns sometime ago), it would save a lot of unnecessary delay in getting the ball back to the umpire when it is out of play, and thus not only prevent the loss of time caused by players worrying at each other in ignorance of the fact that the bone of contention is perhaps required at the other end (from which it has been conveyed by a player, who afterwards understands how he executed such a brilliant run unopposed), but it also gives the central umpire an opportunity of saving his breath for the legitimate functions of his office, which are sufficiently trying without having to yell out for the ball when it is being carried off in triumph by some excited player who is 'boundary' blind." The Carlton hon. secretary and treasurer, McArthur B. Hearne, has resigned due to the pressures of the office demanding too much of his time. Hearne will remain on as treasurer, and W. C. Donaldson will take over the secretary role. M. B. Hearne would serve as Carlton's treasurer from 1880 - 1903. A letter was read from the Melbourne Football Club concerning their goal umpire Mr. Ward who officiated at the recent Melbourne - Carlton game. Ward claimed that at the conclusion of the match he was assaulted by Carlton player and vice captain, George Smith. Both were brought before the committee, Ward said that Smith had shoved him with his shoulder, causing him to fall heavily into the gutter. Smith did not deny that he had shoved Ward, because he considered he had given an unfair decision at an attempt at goal kicked by Carlton. He had not intended to hurt Ward and had apologised to him in the pavilion, and expressed regret at what he had done. The meeting agreed to censure Smith who pleaded that he had not committed an offence in his long career. The South Melbourne delegates responding to the treatment of Umpire J. J. Trait at last week's Carlton match said that they regretted the crowd's behaviour and agreed that anyone who offends should be prosecuted by the Association. The motion of clubs refusing to play at South Melbourne was not tabled. A sunny day with a strong wind, the ground was in good condition. Essendon won the toss and kicked with wind towards the railway end. The wind made kicking for goal very difficult. The Blues scored 13 behinds in the second half. Hannaysee has left the Blues for Port Melbourne, Clydesdale has taken his place. Aitken, Baker, Bloomfield, Clydesdale, Cook, Drew, Hyland, Heatley, Joyce, Johnston, Kelly, Ned Murphy, Melville, O'Bern, Rickards, Rickards, Randall, Smith, Woods, Whelan. Best; Bloomfield, Clydesdale, Baker, Whelan. Players mentioned; (15) Bloomfield, Aitken, Baker, Nairn, O'Bern, Clydesdale, Kelly, James Rickards, Melville, Smith, Whelan, Drew, Spear, Randall, Murphy. Carlton played Hotham at the Hotham Recreational Ground. Carlton won the toss and kicked with a strong northeast wind to the southern end. "The ball in motion excitement rose like thermometer in the sun. Cheers, enthusiasm, and 'barracking' were the order of the day." This is one of the earliest examples Blueseum has found, for the use of the Australian word, "Barracking." Once again the Blue's forwards wasted their oportunities. Carlton were clearly the better team, but kicking for goal let them down. Hotham then rushed the ball to the goal front where the late George Coulthard's antagonist, Joseph 'Joey' Tankard marked the ball dead in front, and kicked the winning goal. An unusual game where no behinds were scored at one end of the ground. Aitken, J. Baker (Capt. ), Bloomfield, Cook, Clydesdale, Drew, Hyland, J. Joyce, Johnston, Kelly, Murphy, Melville, Nairn, Randall, Rickards, Rickards, Swallow, Smith, Whelan, Woods. Goals; Johnston, Smith, Joe Rickards. Best; Baker, Bloomfield, Joyce, Johnston, Murphy, Joe Rickards. Players mentioned; (16) Bloomfield, Baker, Cook, Joyce, Smith, Aitken, Nairne, Johnston, Murphy, Joe Rickards, James Rickards, Kelly, Clydesdale, Randall, Drew, Whelan. Carlton 7th of 8. Played 12 Won 4, Lost 5, Drawn 3, Goals For 17, Against 28. Carlton player Hanneysee returned to play with Port Melbourne. He was playing this Saturday at Port Melbourne Cricket Ground against Star of Carlton. Carlton Second Twenty/Reserves played Hotham at Princes Oval. Where does the Australian word "Barracker" come from? Blueseum has found the word "barrackers" used in the Record (Emerald Hill June 20 1884) newspaper report of the tradesman's match South vs Port Melbourne. The Weekly Times (p6) article on the barracking phenomena. "It is said that the Carlton committee have at last come to the conclusion that it would be advantageous to the club to appoint a properly constituted match committee of five members, to select the teams for their various engagements. This is the rule adopted by other senior clubs, and by all found to work in a most satisfactory manner. It may be stated that great dissatisfaction has existed amongst the members for a considerable time past as to the manner in which the teams have been selected, good players being left out and inferior ones retained, this to satisfy some whimsical fancy of the committee man. With the adoption of the rule, this unfair and unpleasant state of things should be altogether avoided." "Sometime back efforts were made with a view to the amalgamating of the Carlton Cricket and Football Clubs; for this purpose of having a properly enclosed ground, where upon both teams could play in their repective seasons, and charge for admission (same?) to non members. For some reason or other, the matter was not proceeded with, but as this agitation has again been revived, it is hoped that both clubs will meet on an amicable footing, and carry it through to a successful issue." The ground was in excellent order, thanks to a flock sheep that grazed on the arena. A monotonous game with the ball for long periods out of bounds on the northern wing. Fitzroy won the toss and kicked to the eastern end. Rain and a bitterly cold south wind marred the second half. "An afternoon like Saturday last would be bad enough under the most favourable conditions of situation, but in the Princes-park, bleak and exposed, with a strong southerly gale keeping the ball constantly out of bounds on the north side, the intermittent heavy showers to render the onlooker of the drowned-rat order, the whole thing was very miserable. How the spectators stuck to their posts, and manfully braved the elements, is but another proof of the triumph of enthusiasum over comfort, and speaks volumes for the attraction of the noble game." Future Carlton coach, Worrall was one of Fitzroy's best. Smith kicking out from a behind, kicked the ball straight to a 'Roys player who kicked the equaliser. Ex Blue Elliott, was beaten on the day by Drew. Aitken, Baker, Bloomfield, Clydesdale, Cook, Drew, Hyland, Heatley, J. Joyce, Kelly, Murphy, Melville, O'Bern, Rickards, Rickards, Randall, Smith, Swallow, Woods, Whelan. Best; Heatley, Bloomfield, Baker, Drew, Clydesdale. Players mentioned; (15) Smith, Hyland, Whelan, Clydesdale, Cook, Drew, Heatley, Rickards, Bloomfield, O'Bern, Kelly, Joyce, Baker, Spier?, Fleming. Carlton Reserves played East Melbourne at Royal Park. Aitken, Armstrong, Bismire, Carter, Coulthard, Hadley, Elliott, Jackson, Lemon, Launders, Lewis, Martin, Manly, O'Shannessy, O'Shanessey, Slattery, Slattery, Plummer, Robertson, Shand, Tickle, Westwood. A letter was read from the Melbourne Football Club protesting at the Council's Parks and Gardens committee take over of the Metropolitan football ground. This football ground adjoins the M.C.G. on the northern side of the cricket ground between Wellington Parade. The M.F.C. letter was read, "complaining of the unjust manner in which the club had been deprived of the use of the ground which it's members had played on for upwards of 25 years." The club was promised another part of the park, but now this seems unlikely. In 1885 Melbourne moved it's home to The Friendly Societies ground near today's so called Lexus Centre. Melbourne would not call the M.C.G. home until it was amalgamated with the M.C.C. in 1890. Interestingly between 1885 - 1896, Carlton played most of it's home games on the M.C.G. The first intercolonial football match between New South Wales and Queensland took place on the Albert Sports ground Brisbane. "Of the strength of the Melbourne game in Queensland little further need be said than in all parts of the colony the rules and laws of the Melbourne Association are recognised and played, whilst the association quartered in Brisbane is continually adding to it's number of of clubs represented." Football is comparatively young in the neighbouring colony of N.S.W. but the association in Sydney now numbers many clubs. N.S.W. will play seven matches, two intercolonial, three with Brisbane clubs and matches in Toowoomba and Ipswich. NSW colours Blue and White. QLD colours Red and Black. Former Carlton men, ex skipper William Goer, and G. O'Neill played for the southern team who won the game. W. Goer was named among the best players. See August 30 for second match. Blues fans left on a special train from Spencer Street at 1pm. Crowd; In excess of 4,000. Weather was fine, and a slight wind was blowing from the north east. Baker won the toss and kicked to the southern goal. The Blues ran out of steam in the second half and were over run. Woods and O'Bern did not play. Aitken, Baker, Bloomfield, Clydesdale, Cook, Drew, Hyland, Heatley, Joyce, Johnston, Kelly, Murphy, O'Bern, Rickards, Rickards, Randall, Swallow, Smith, Woods, Whelan. Goals; Bloomfield 1.1, Baker 1.1 Murphy 0.1, Whelan 0.1, Heatley 0.1, McGillicudddy 0.1 rest unknown. Players mentioned; (17) Randall, Nairn, Bloomfield, Baker, Whelan, Heatley, Drew, Ned Murphy, Cook, Joyce, Melville, Joe Rickards, Johnston, Spear, Kelly, Smith, Rickards. The Geelong Advertiser in its Monday match report mentioned McGillicuddy, who scored a behind, amongst the Carlton players. Carlton Reserves played Geelong on the Aberdeen Street Ground. Best; William Westwood, Saunders, Powell, Davey, Hadley. "NED MURPHY of the Carlton, ought to be a good judge of the game of football, he having long experience and played with several prominent clubs. he says that Bert Rappiport and Lindsay, of the Fitzroy, are two of the fairest players he ever encountered, and that Jack Baker of the Carlton, is the best player in the colony, only that he is not the good graces of the Press correspondents. By-the-bye, amongst his associates Ned is titled "Cocky." Would not "Shuttle-cocky" be a more appropriate title?" A very poor crowd reflecting the season of these two traditional clubs. Not so long ago a Melbourne-Carlton match would draw at least 10,000. Carlton won the toss and kicked to the railway end with the aid of a strong breeze. Melbourne came back strongly in the second half. Baker, Bloomfield, Cook, Clydesdale, Drew, Heatley, Hyland, Joyce, Johnston, Kelly, Melville, Murphy, O'Bern, Rickards, Rickards, Randall, Smith, Swallow, Woods, Whelan. Best; Bloomfield, Baker, Joyce, Whelan. Players mentioned; (10) Aitken, Nairn, Whelan, Heatley, Rickards, Baker, Joyce, Bloomfield, Murphy, Connellan. Carlton Reserves played Melbourne Imperial or Clyde at Princes Oval. The Herald said they were to play Melbourne Imps. Armstrong, Bismire, Beire, Carter, Coulthard, Davey, Dunn, Elliott, Gordon, Gordon, Hadley, Jackson, Lemon, Saunders/Launders?, Manby/Manly?, Mulvihill, Martin, Powell, Shand, O'Shannessy, O'Shannessy, Slattery, Slattery, Westwood. The second intercolonial match between New South Wales and Queensland in Brisbane. A crowd in excess of 2,000 attended. Former Carlton players G. O'Neill and W. Goer played well for NSW. The grandstand at the M.C.G. was completely destroyed by fire. McAlpine the curator had left the grandstand at 8.40am and went to his cottage nearby. At 9.15am one of his children in the cottage gave the alarm. McAlpine played a hose on the fire, but within 20 minutes the whole stand was ablaze. The fire was spotted from the look-out tower at the Eastern Hill Fire Brigade and suburban units rushed to the scene. "The Insurance Fire Brigade, followed in rapid succession, by the Hotham, Fitzroy, Richmond, Carlton Brewery, Collingwood, Simpson's-road, Yorkshire Brewery and other brigades were on the ground, but they could do nothing, as the heat was intense and the water pressure insufficient." "To show the intense heat that prevailed, it may be remarked that parts of the picket fence in front of the stand, distant about 30 feet, were charred through, and the grass on the playing portion of the ground was (although quite green) burnt off for at least five yards from the fence as if a bush fire had passed over it in the middle of summer." The fire originated in the skittle alley where saw dust was used to keep the skittles upright. It is believed the ashes from a cigar or pipe ignited the saw dust which smouldered over night. The stand was built in 1877 and occupied an area of 240x80 feet. It ranked among the best in the world and could accomodate up to 3,000 people. A rather plain building, it however could be reversed so the stand could face the Metropolitan ground for football and then reversed again to the cricket ground. A two story building, the ground floor contained a large luncheon room, skittle alley, ladies room, and two refreshment bars. The seating area was above this and was reached by three broad stairways. The original cost was £4,000, but repairs and expenditure equals £5,890. The M.C.C. had the stand insured for £3,000. South won the toss and kicked to the lake end. Playing with the wind South quickly scored two goals and then anothe two later in the half. Murphy kicked two quick goals just after half time, South Melbourne then scored their fifth goal, then Baker with a long running drop kick scored the third, Bloomfield with a long kick scored the fourth, Joyce tied the game a few minutes later. Aitken, Baker, Bloomfield, Cook, Drew, Heatley, Joyce, Johnston, Kelly, Murphy, Melville, Nairn, O'Bern, Rickards, Rickards, Randall, Smith, Swallow, Woods, Whelan. Goals; Murphy 2, Baker, Bloomfield, Joyce. Best; Bloomfield, Baker, Kelly, Murphy, Woods, Whelan. Players mentioned; (12) Baker, Whelan, O'Bern, Drew, Swallow, Joyce, Smith, Spear, Bloomfield, Murphy, Kelly, Woods. Armstrong, Bismire, Beire, Coulthard, Dunn, Davey, Elliott, Hadley, Gordon, Gordon, Jackson, Lemon, Lauders, Manby/Manly? Mulville/ Mulvihill?, Martin, Powell, O'Shannessy, O'Shannessy, Shand, Slattery, Slattery, Westwood. Carlton Reserves lost; 0.7 - 1.5. The old Melbourne Football Ground (the Gravel Pit) adjacent to the M.C.G. is no more. The area had been incorporated into the surrounding Yarra Park. The old ground has been levelled with new grass sown and an avenue of elms has been planted. "It is gratifying to see that the South Ground is now well protected from the rowdy element (which in the past was mainly the cause of the unseemly disturbances that used so frequently to take place), there being no less than five mounted troopers patrolling, and seven or eight gentlemen in blue stationed at different places on the ground so as to keep in check any outbreak that may take place. The presence of these officials caused some good natured-chaff to pass between some of the supporters of the blue and white and the reds, the former remarking that over in Carlton they did not require them, whereupon the latter retorted, "No, but they would want fifty over there." A small crowd attended, the day being not very pleasant for football. A strong cross wind blew favouring the eastern end. Williamstown won the toss and kicked with the wind. After half time the Blues ran rings around the Villagers. Aitken, Baker, Bloomfield, Carter, Drew, Heatley, Hyland, Johnston, Joyce, Kelly, Murphy, Melville, O'Bern, Randall, Rickards, Rickards, Smith, Swallow, Woods, Whelan. Best; Whelan, Drew, Baker, Lewis. Players mentioned; (12) Whelan, Rickards, Bloomfield, Johnston, Lewis, Drew, O'Bern, James Rickards, Baker, Aitken, Heatley, Carter. Carlton Reserves played Williamstown at Williamstown. Armstrong, Bismire, Beere, Coulthard, Davey, Dunn, Elliott, Gordon, Gordon, Hadley, Jackson, Knopp, Lemon, Launders, Manby/Manly?, Martin, McKinley, Powell, O'Shannessy, O'Shannessy, Slattery, Slattery, Westwood. With a half gale blowing across the ground, most of the play was on the southern side. The Blues lost the toss and kicked to the western end goal. Essendon's eastern end goal was favoured by the wind, and at half time the wind shifted and then favoured the western end goal. Essendon had the better of the play in the second half, but the ball was almost continually out of bounds on the southern side. Aitken, Baker, Bloomfield, Cookson/Cook, Drew, Hyland, Heatley, Joyce, Johnston, Kelly, Murphy, Melville, O'Bern, Rickards, Rickards, Randall, Smith, Swallow, Woods, Whelan. Umpire; J. J. Trait, Geelong. Best; Whelan (BOG), Baker, Bloomfield, Johnston, Drew, O'Bern, Smith. Players mentioned; (19) Murphy, O'Bern, Kelly, Baker, Woods, Bloomfield, Whelan, Aitkin, Johnston, Spier/Spear, Rickards, Cook, Melville, Hyland, Drew, Smith, Heatley, Joyce, Dunne. Friday's Herald said they were playing North Park. Carlton held it's close of season ball at the Athenaeum Hall. About 75 couples kept the dancing going until the early hours. Carlton played a match against "all comers" at Princes Oval. Carlton were scheduled to play South Yarra (23) but this match was cancelled. Carlton Second Twenty played Hawksburn at Albert Park. "But a little behind South Melbourne and Fitzroy inpoint of record (6-9-2)* the Carlton this year fills up sixth position, a place it has never yet been my lot to assign it, during my long association with the brethern of the fourth estate. 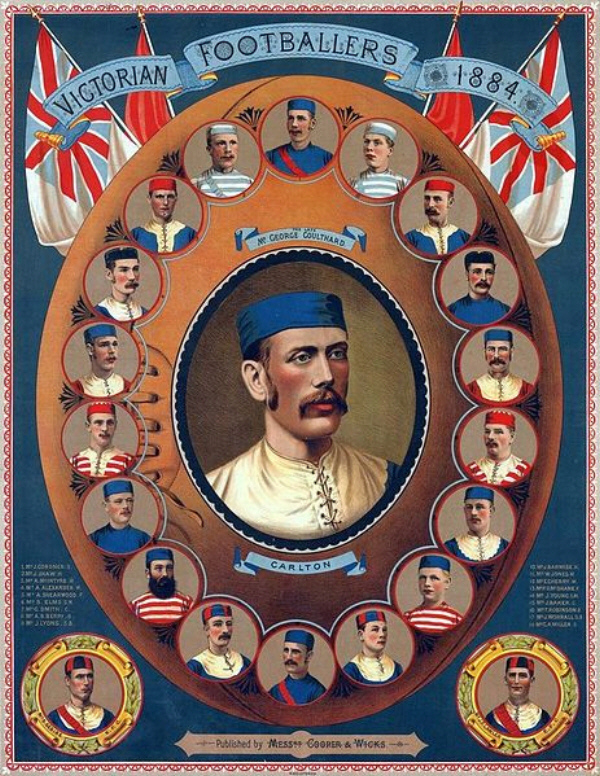 The split in the ranks of 1883, which was largely responsible for the formation of the Fitzroy Club, made the first twenty rather weak at the start of the season. (see below) The team, however, improved with the term, and had it's discipline been as good as it's units, the result must have been a great advance on it's present humble place, which a change in the internal management of affairs is predicted as likely to affect very materially next season. Baker, Bloomfield, Smith, Whelan, Kelly, O'Bern, Joyce, Murphy, Joseph and James Rickards, Drew, Aitkin, Woods, Randall, Melville, Johnston, Hyland, Heatley, Swallow, and Nairn. Baker was named by Pindar as third best player in the competition. "Baker of Carlton whose judgment is rarely at fault in the most trying emergencies." Bloomfield who kicked 10 goals was named among the better followers. Whelan was named in the next rank of followers. Joyce among the better rovers. Drew among the better wingers. Interestingly former Blues, now Fitzroy players, Cameron and 'Abe' Shearwood were named among this season's best players in the Association. Also A. Elliot was named among Fitzroy's better players this year. The Williamstown Chronicle published a poem by Williamstown supporter "J.J.R"
They will do their best to win. They'll show you how to treat them. You never hear a grumble. They are sure to hurt a fellow. And sometimes give a bark. The Carlton Story. Hugh Buggy and Harry Bell. Pages. 56, 57, 259. The South Australian Register, 1884 editions. The Williamstown Chronicle, 1884 editions. Williamstown F. C. web site. Contributors to this page: blueycarlton , Jarusa , molsey , nikki and admin . Page last modified on Monday 25 of February, 2019 21:00:13 AEDT by blueycarlton. 1986 - Wayne Blackwell article (page 2 of 2) 24/04/86.